A traditional popular Indian vegetable dish made healthy and easy! Try your hand at this version of Indian Spice Stuffed Eggplant & Potatoes. Made with delicious herbs and spices and baked to perfection! Where Does This Dish Come From? Indian Spice Stuffed Eggplant & Potatoes, otherwise also known in Gujrati as ‘Bharela Ringan Bateta nu Shak’. It is a traditional Gujarati vegetable dish that’s become very popular over the years. 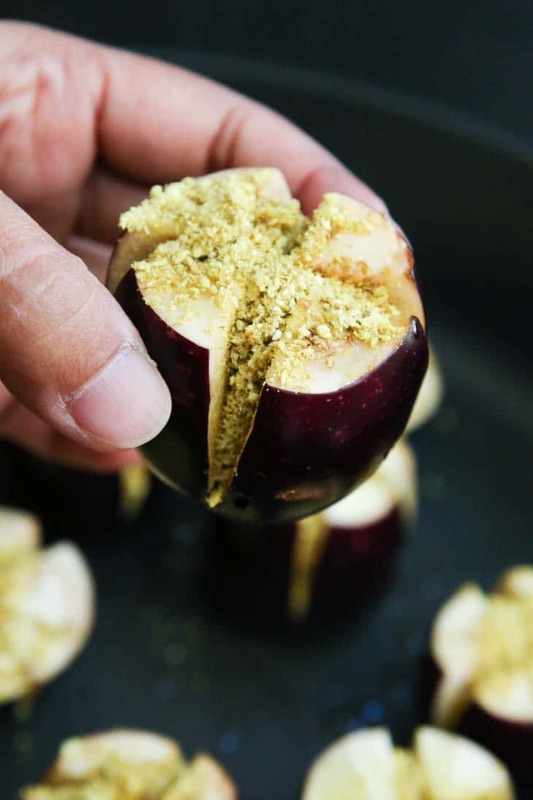 It consists of eggplants and potatoes stuffed with a chickpea flour based filling. It’s savory, it’s sweet, very simple and easy to cook, and tastes delicious. This recipe gets its unique flavor from the stuffing, which I’ve already made very easy for you with my Easy Indian Spice Blend recipe I posted a few weeks ago. 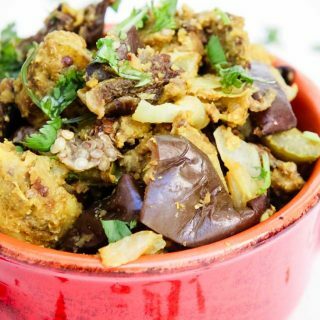 Now this is not just any Indian Stuffed Eggplant & Potatoes recipe, since there are many different versions of this very popular dish. I’ve had it at restaurants, dinner parties, and other family and friends’ homes, yet I’ve only ever loved and cared for my Mom’s version of the dish. You may be thinking that I’m biased, because I’ve been having it ever since I was young, but that not true at all. My grandmother passed her recipe down to my Mom, and she in turn has modified it many times and perfected it. There’s something about the unique flavors of her savory dry mix composed of chickpea flour, ground peanuts, coconut, and some of my favorite Indian spices (see my Easy Indian Spice Blend recipe) combined with her cooking method that makes this particular recipe amazing! It’s very healthy, not dripping with oil (as you typically see with other versions), very easy to make, bold in flavor, and irresistibly delicious! It was and still is one of my favorite Indian dishes, hands down! It was the one dish I frequently craved and requested when I came home from college to visit. A few years back, I realized that it was ridiculous that I hadn’t recreated this dish myself at home knowing how much my entire family loves it. Plus, aren’t these baby eggplants gorgeous and screaming to be stuffed?? Many of you guys have requested this recipe after having seen pictures of me making it on social media, and so finally here it is, my Mom’s easy and healthy version of Indian Spice Stuffed Eggplant & Potatoes! My entire family loves this dish. We typically serve it with a side of rice, some home-made roti, or tortilla. I also love using leftovers the next day for lunch to make an awesome sandwich (YES…you can even make a sandwich out of this vegetable dish!!!). Simply sandwich the leftovers in between two slices of your favorite bread (whole wheat or sourdough being my favorite) and place it in a sandwich maker until it’s nice and grilled/crispy on both sides. Using a sandwich maker works well because it seals the sandwich on all sides so that the contents don’t fall out when pressed. Not to mention, the sandwich version is perfect for the kids and even makes for a great school lunch option. If you already have a pre-made jar of my Easy Indian Spice Blend in your fridge, then pull it out and make this one of your next weeknight meals. If not, then this is a great time to try it out. Once you try out this recipe, you’ll be glad you have a large batch of the dry mix ready to go. And if you’re new to Indian spices and cooking, this is the perfect recipe to get you started…it’s easy, straightforward, and will leave you craving more! Make my easy Indian spice blend in advance. It’s easy to whip up and can be used in so many dishes. Keep it in the fridge and use as needed. If you can’t find baby eggplants you could use regular sized. Try cutting them into larger chunks and coating them in the spices. There are two methods for cooking this dish, see the recipe card below for both. One is easier if using regular sized eggplant. If you don’t like cilantro then try using fresh parsley to top the dish. You could also use a little fresh mint. This recipe makes great leftovers see the options above or in the recipe card. Store leftovers in a suitable airtight container to avoid spoiling. 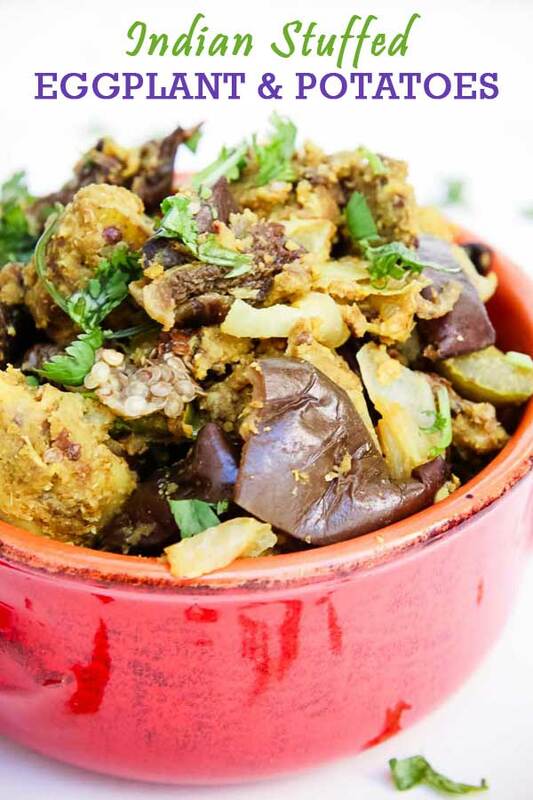 This traditional Indian dish consists of eggplants and potatoes stuffed with a chickpea flour based filling. It’s savory, it’s sweet, very simple and easy to make with the use of with my Easy Indian Spice Blend! 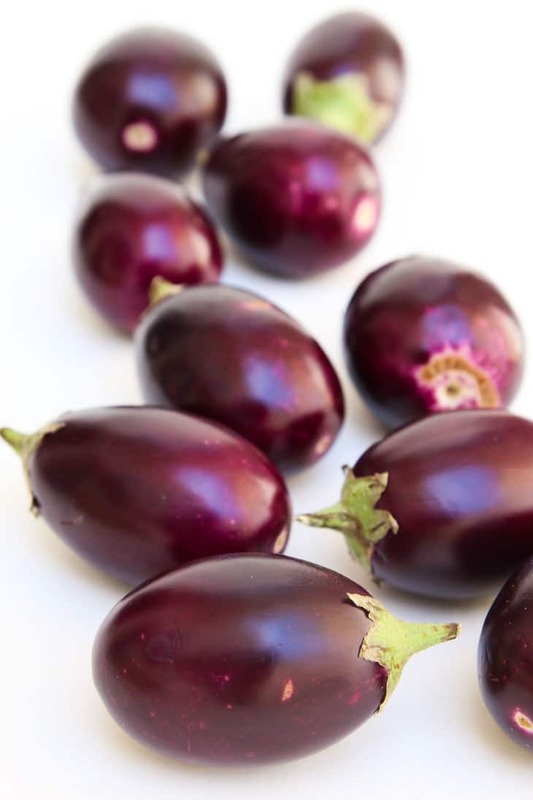 Cut the top and bottom off of each baby eggplant so that they are each shaped like a cylinder. Using a knife, slit each eggplant cross-wise on the top of one side leaving some room at the end. Be careful to NOT slit them all the way through to the bottom of the eggplant (should be joined at the base). See images in the post. Using your fingers, stuff the Easy Indian Spice Blend in each of the cross-wise slits made in the eggplants and set aside. In a large wide non-stick pan, heat 1 teasp cooking oil on medium heat. Add the diced white onions and bell peppers and saute on medium-high heat for a few minutes until the onions start to become translucent. Set aside in bowl. Quickly wipe down the large non-stick pan with a wet paper towel to clean and cool it down. Heat the non-stick large pan again on medium heat and add 1 teasp cooking oil. Add the black mustard seeds and minced garlic and fry for ~30 seconds until the garlic starts to sizzle. Add the asafoetida (if using) and fry for a few additional seconds. Turn the heat to medium-low. 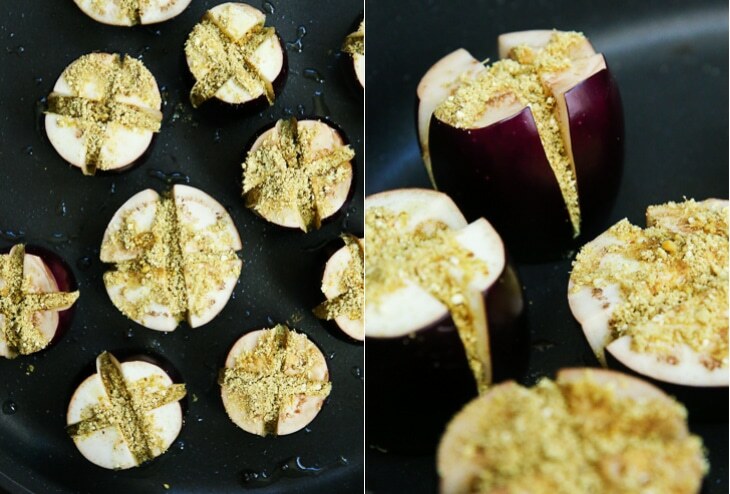 Place each stuffed baby eggplant slit side up in the pan. Sprinkle ~2 tbsp water on top and cover. Cook on medium-low heat until the stuffed eggplants are cooked through (15-20 minutes). Stir in between a few times and add small amounts of additional water (~1 tbsp at a time) if needed to evenly cook the eggplant. While the eggplant is cooking, cook the potato (see notes below) so that it's tender, yet still firm. Peel, dice into large pieces, and set aside. See notes below on how to cook. Once the stuffed eggplant is cooked (knife should go through gently), remove the cover, add in the cooked diced potatoes, onions, and bell peppers. Gently mix and fold everything together. Turn the heat to medium. Sprinkle about 1/2 cups + 2 tbsp of the Easy Indian Spice Blend on top, followed by some water as needed to keep the dish from becoming dry (about 1/3-1/2 cup water slowly sprinkled in while cooking). Mix to combine and allow the dish to cook uncovered. Add 2-3 teasp salt (as needed to taste), and some chili powder (if using for spice). Cook for an additional ~10 minutes, turn off the heat, and generously garnish with finely chopped cilantro. To serve, (1) enjoy with cooked rice, fresh roti/tortilla, or (2) sandwich the Indian Spice Stuffed Eggplants & Potatoes in between two slices of bread (I typically use sourdough or whole wheat) and press in a sandwich maker until sealed, grilled, and crispy on both sides. I usually choose to make option (2) above the following day with any leftovers and serve it with some ketchup (for the kids) or hot sauce. Cut the eggplant and potatoes into medium pieces. Instead of stuffing the eggplant, once the onions and peppers are done cooking, add in the uncooked potatoes first and cover for a few minutes to pre-cook. Add the eggplant pieces, cover, and cook until both the eggplant and potatoes are tender (follow the method above for cooking covered). 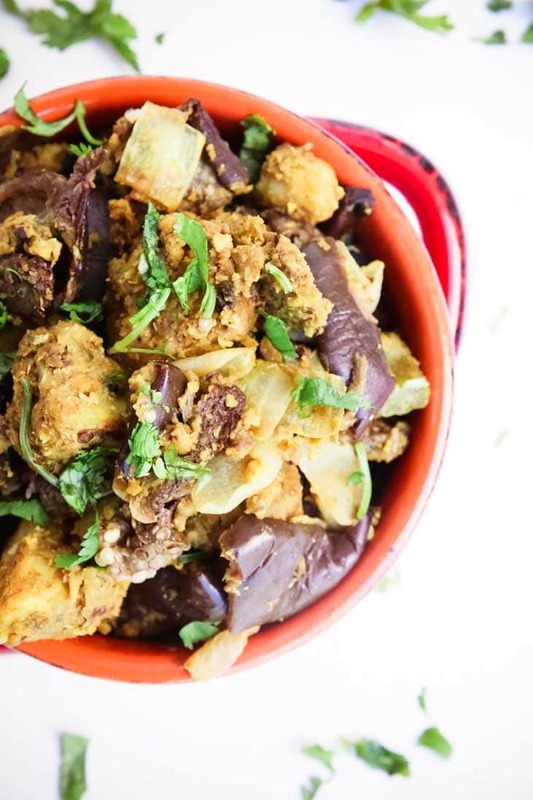 Once the potatoes and eggplant are tender (not mushy), add in the bell peppers & onions and sprinkle on a generous amount of my Easy Indian Spice Blend so that the entire dish is coated. Follow the steps above to finish off the dish, and season with salt. To Cook Potato - I typically use my Microwavable Steamer for this step by slicing the potato in half lengthwise, placing it in the steamer with 1-2 tbsp water at the base, and microwaving it for about 5 minutes. Allow the potato to cool with the cover off, peel, and dice into large sections. Alternatively, you can boil the potato, but be sure not to overcook so that it loses it's shape when diced. Oh the baby ones are my favorite to work with! Although whenever I see them at our local market, this is the only dish i ever want to make with them! I love baby eggplants. They are so cute! Great recipe. Lovely flavours going on and I can't wait to try! Thanks Mel! We love this dish in my house. It may seem complicated but is very easy especially if you have the spice blend pre-made and ready to go! Let me know if you try it out! Wow! These are gorgeous. I'll be looking for baby eggplants at the farmer's market! Hopefully you find them because they're my favorite! Especially great for stuffing!! Thank you! Have you had this dish before? I love working with baby eggplants they are gorgeous! This just looks out of this world! The spices you added to this...wow! Thanks Lucie! It's a dish I grew up having and LOVE! We make it at least 2x a month if not more! The Spices are very easy especially if you have the blend pre-made and stored in the fridge. Unfortunately I havent, we make our eggplants plain, with no potatoes in but this looks great! You should definitely try it! The blend makes cooking indian food super easy! I just returned from a yoga training course in Goa, where they kept us on a strict sattvic plan. On returning home, I've been frustrated because many recipes I have trouble understanding method or ingredients which are not familiar to me. This looks like a site I can finally try! Thank you! I have a question, though- is it possible for these recipes to work if I leave out the non Jain ingredients, like potato and onion? Hi! Thank you so much for following and getting in touch. I'm glad you're finding my site helpful after coming back. And yes, I'm actually very familiar with a JAIN diet. Although I do not follow it myself, I grew up JAIN like my parents. And the answer is YES...you can easily leave out non-jain ingredients and sub them with others. Of course it highly depends on the recipe. There are some where those are the main ingredients then it'll definitely come out different. For instance, for this recipe, you can easily use the Easy Indian Spice Blend on just about any vegetable or leave out the potato. If there are recipes you have in mind that you want to try, feel free to comment on them and let me know so I can advise properly! Thanks for following! Let me know if you try a few out. We love it. Easy to make and I do keep masala ready . Good spicy and yummy shak.